With item A and B the solution is simple, make sure the pipe line is free from debris before fitting it (a good idea is to always fit some form of filter/strainer) and secondly check the compatibility of fluid being used against the seal material before ordering, we have a good chemical resistance chart that will assist you with selection or just give us a ring and we will be glad to help. The third problem is a bit more difficult to understand and is explained and shows the differences in designs of solenoids in The Knowledge which you can download by clicking this link. 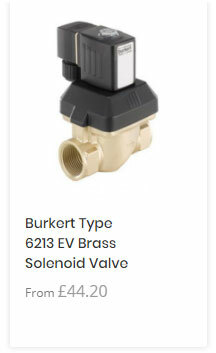 However in brief the customer has probably purchased a servo assisted valve which needs a minimum differential pressure to work fully and our servo assisted valves need a minimum pressure to operate. What people don’t understand is that to achieve a 1 bar head (fed by gravity) you need to have 10 metres of head and that is irrespective of volume. 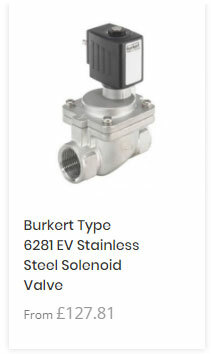 These solenoid valves from the new product series EV are suitable for a broad spectrum of standard applications for fluid and gaseous media. Typical applications are water, compressed air and vacuum such as to be found in car washes, drinking water treatment plants, swimming pool technologies, heating and refrigerating systems. The 6213 EV valve is a servo-assisted solenoid valve of the EV series. 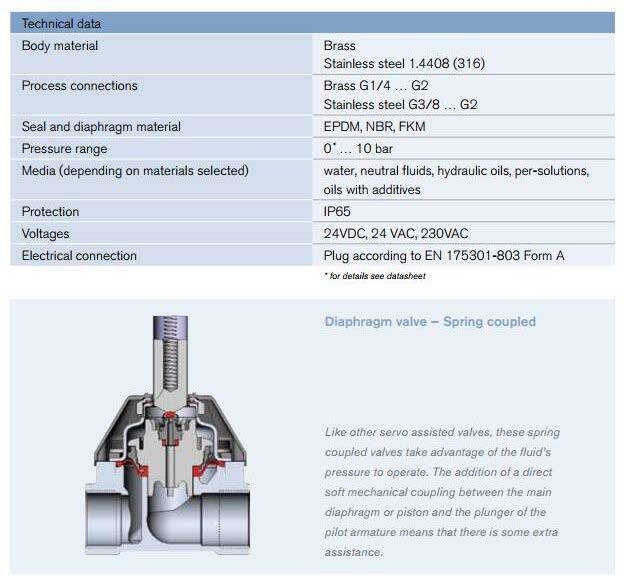 The spring coupling of the diaphragm supports the opening process of the valve. 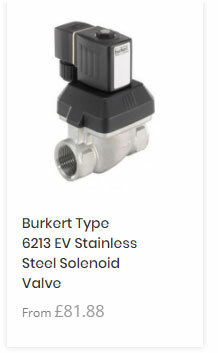 In its standard version, the valve is suitable for use in liquids. A minimum differential pressure is required for complete opening. A special version (HP00) which opens the valve without differential pressure is available for gas and vacuum applications. Various diaphragm material combinations are available depending on the application. The standard brass housing satisfies all European drinking water requirements. Lead-free or dezincification-resistant brass types are available for other markets. The housing offering is rounded out by a stainless steel version. The solenoid coils are moulded with a chemically resistant epoxy. For reduced energy requirement, all coils can be delivered with electronic power reduction. 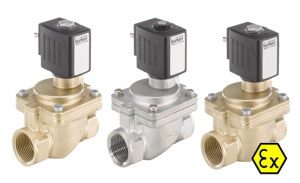 In combination with a plug in accordance with DIN EN 175301-803 Form A, the valves satisfy protection class IP65 – in combination with a stainless steel housing NEMA 4X. 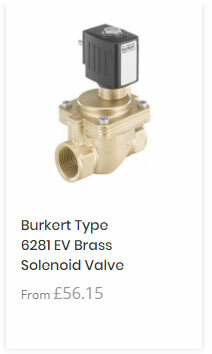 The 6281 valve is a servo-assisted solenoid valve of the EV series. 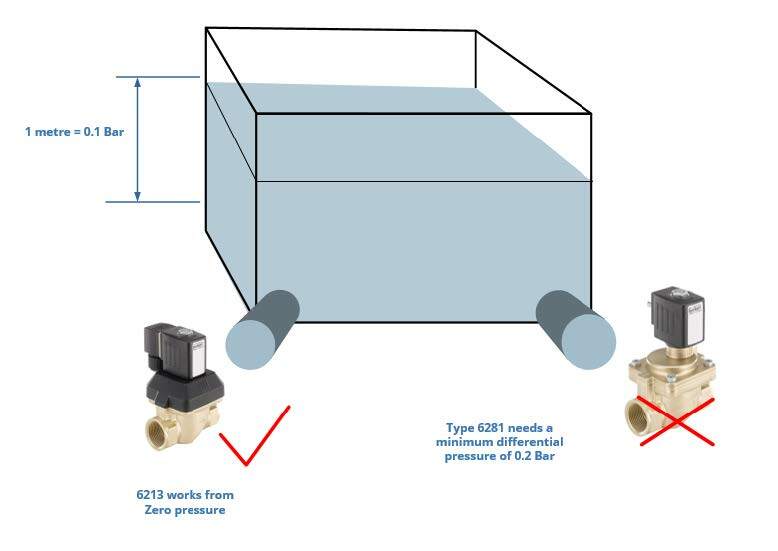 A minimum differential pressure is always required for the proper function of the valve. Various diaphragm material combinations and methods of operation are available depending on the application. The standard brass housing satisfies all European drinking water requirements. Dezincification-resistant brass is available for other markets. The housing offering is rounded out by a stainless steel version. The solenoid coils are moulded with a chemically resistant epoxy. For reduced energy requirement, all coils can be delivered with electronic power reduction. 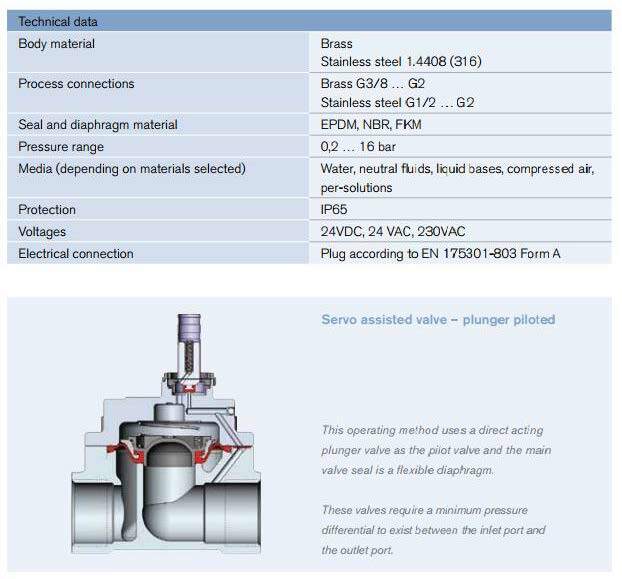 The valve can be equipped with manual override for easy maintenance and commissioning. 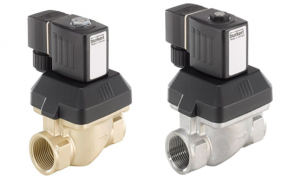 In combination with a plug in accordance with DIN EN 175301-803 Form A, the valves satisfy protection class IP65 – in combination with a stainless steel housing NEMA 4X. 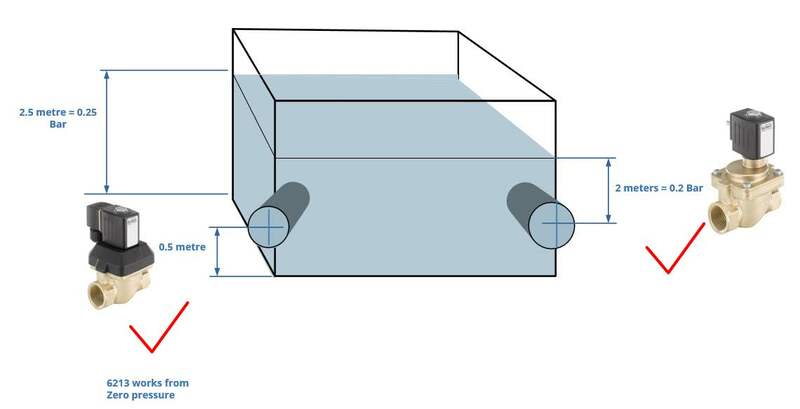 The information below is a very basic diagram aimed to give a general idea of servo assisted valves compared to the direct acting.